Polylab Aspirator Bottles are made of Polypropylene and are therefore much lighter than glass. These are autoclavable, durable & dependable.The autoproof spigot screwed to the bottlebody requires only a half turn to open or close. 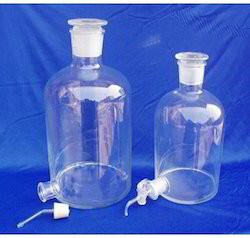 These bottles are used for storing or dispensing distilled water and other laboratory solutions. Threads should be totally disengaged before autoclaving. We are offering fine quality Aspirator Bottle to our most reliable customers which are situated all round the nation. Our bottles have several good qualities such as they are reliable and durable. These bottles are strictly checked by quality auditors on varied parameters, before the final delivery. Boro 33 glass with stopper at the top, outlet socket 29/32 near the bottom for stopcock. Capacity: 5, 10 & 20 Ltrs. 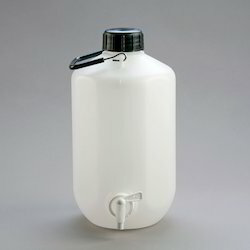 Features: These bottles are used for storing or Distilled water & other laboratory solutions. Isoprenaline, or isoproterenol, is a medication used for the treatment of bradycardia, heart block, and rarely for asthma. It is a non-selective β adrenoreceptor agonist that is the isopropylamine analog of epinephrine. In order to cater the diversified demands of our clients, we have been able to provide a unique range of Aspirator Bottle.